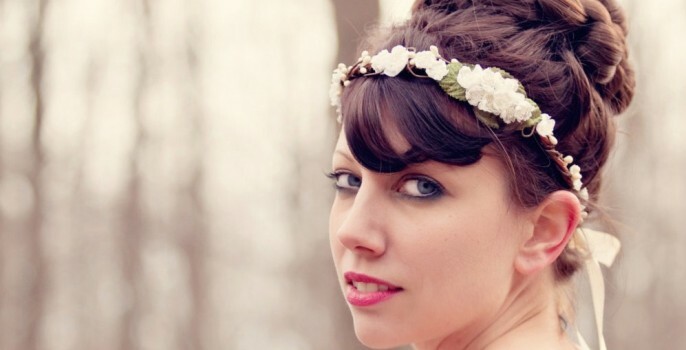 Emily Zych of Whichgoose creates beautifully crafted flower hair crowns and other accessories. She’s a seasoned Etsy veteran, with over 8000 sales and nearly five years on the site. 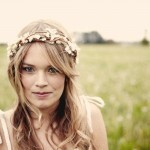 She’s been featured on Etsy’s Quit Your Day Job series and Etsy blog, along with countless other sites. When you planning your shop, did you instantly know that you wanted to have a bridal shop? Not at all! My first sales were vintage items. I was scared to actually put myself out there and sell something I had made. 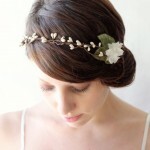 I was really scared of rejection – or someone buying my handmade item and saying “this is crap!” It was a gradual process to start making and selling hair accessories, and then focusing more on brides. You’ve been selling on Etsy for years; how do you handle all the changes on the site? I’ll admit at times it is frustrating. As a business owner, you want to have full control of your business! Having Etsy making changes under your feet is hard to handle at times, but it does force me to reconsider how I do things. Sometimes it’s good to get out of your comfort zone to grow. Was there a time that you questioned whether your shop could be a success? Everyday. I still go through highs and lows depending on what I sell each day. I don’t know if every business owner does this – I might just be obsessed. Designing and creating is my passion, so there really is no lack of motivation when doing something you love. I’d still be creating in my spare time if my business didn’t exist. How did you know when it was time to make the leap and sell full-time? The main motivation for making the jump to full-time was that I was really unhappy with my job. It was night work, my boss was a jerk, and I was spending all my time sitting at a desk thinking about Etsy. How do you structure your day to allow for marketing, creating, designing, picture taking, etc.? Oh I am no where near that organized! I have an idea of what I want to get done in a day, then work until it’s done. Sometimes I stay up with my laptop in bed until 1 or 2 in the morning – other days I call it quits around dinner time. Have you found participating in Etsy teams and forums to be helpful? I’m on a treasury team that has been great for marketing within Etsy. It’s a lot of work, since you have to make lots of treasuries, but the payoff is having your work seen by people that wouldn’t see it otherwise. Lots of sellers have trouble getting exposure. What are the top ways that you draw traffic to your Etsy shop? Having a unique product definitely gets more people in. Even having a product that is presented in a unique way can be beneficial. In terms of search, I have search ads on Etsy and I try to work on my tags and titles to make them as relevant as possible. How have your traffic and sales grown over the life of your shop? I had a big boost in 2010-2011 – that was when I really took off. I’m not sure what happened really. It could be attributed to Etsy growing as a community, or my shop growing along with Etsy. It’s been steady since then, though there was a definite drop with the search relevancy change. Are there tasks that you gladly pass over to others to do (bookkeeping, taxes, etc.)? I actually love the bookkeeping aspect of it. It helps me stay on track with my personal spending and with setting goals for each month. I would gladly give up the shipping process. Something about the sound of tape being pulled off a roll… shudder. Congratulations on your engagement! Do you feel more in touch with your clientele now that you’re planning your own wedding? Thanks!! I’m definitely more sensitive to the needs of brides. Sometimes they need reassurance that their package will arrive on time. It’s best to make everything as easy as possible. There are a billion and one decisions to be made as a bride; I want to make the decision to buy a hairpiece from me an easy one. Have you been successful preparing collections, as you hinted at in your QYDJ article? Sadly, no. I just get too excited when I create a new piece that I love. There’s no way I can hold onto it for months preparing for a big reveal. I’ve accepted that my business just doesn’t work that way. A big thanks to Emily for taking the time to answer some questions. 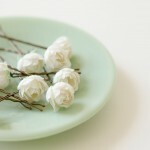 Be sure to follow her blog, where you can see things like her amazingly low-tech photo studio! Emily can also be found on Facebook, Twitter, Pinterest – and of course, her Etsy shops, Whichgoose and Vintage Whichgoose.